It seems like most of the houses I’ve lived in had this feature… you could go into the basement with a pencil and there would be a pencil sharpener attached to the wall (or a wooden post) and you could sharpen a pencil. This “feature” was something I just expected, and when I went downstairs into my basement (where I already spend a lot of time because my workshop is down there) I realized there was no pencil sharpener! Then I thought about it, and remember that (even though we’ve lived here for over three years) there was no pencil sharpener in the basement! Well, there was, but it was a crappy electric one that fell apart and then I fixed a few years ago. Oddly enough my mind just filled in the spot that says “there is a pencil sharpener on the wall in the basement” even though there wasn’t. 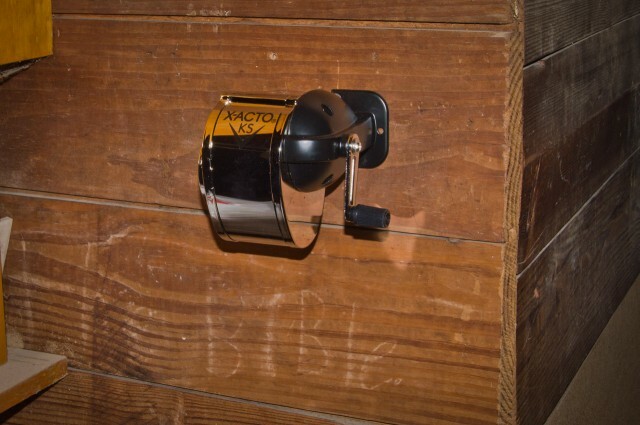 So I asked people… Have you lived in a house where there’s a pencil sharpener mounted to a wall in the basement? And over 100 people on Facebook replied. I distinctly remember the previous house we lived in had one. I didn’t take it with us because we didn’t own the house, and I just figured it was a “feature” of the house, like a stationary tub or whatever. You wouldn’t take the stationary tub when you moved, would you? 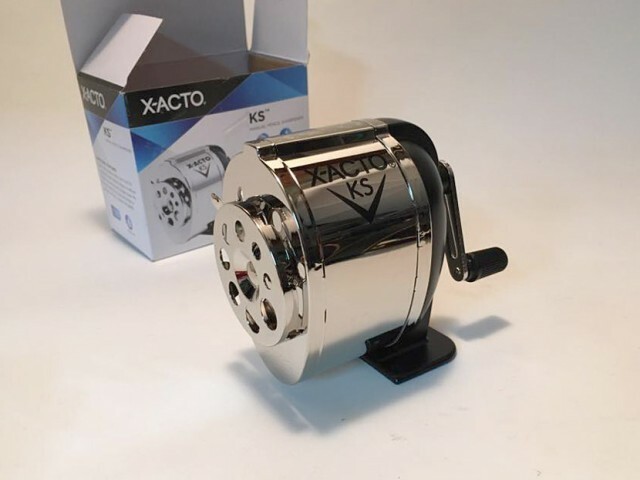 I found the X-ACTO KS Manual Pencil Sharpener, Metal Finish for $9.99 on Amazon Prime. I had it in two days. It’s glorious. Now, when I decided to mount the pencil sharpener to the wall (or a wooden post) I had some problems. I mean, where should it go? I didn’t want it in the way, but wanted it accessible. I opted for a wall near our “storage” part of the basement. Here’s where it gets tricky/weird/problematic. First of all, the sharpener came with two screws but the base has three holes. Weird. I then drilled two holes, screwed in one screws, then the second screw, and the head snapped off the second screw. Argh! This was okay though, because I then realized the spot I had chosen didn’t even allow for a brand new pencil to be sharpened because it was too close to a shelf to get a pencil into the sharpener! I then drilled more holes, and moved the pencil sharpener to the right a bit. Plenty of room for pencils! I also used some larger drywall screws. It’s in there good, and should remain in place… until we move, when I remove it to take it with us. Just in case. As for that photo above, yes… you can see the word “BiBle.” on the wall. Which is pretty weird. I mean, I’ve never noticed it before, but it is in a darker corner of the basement, and I’ve never really shined a bright light on that wall, or used a camera flash on that wall. What does it mean!? Hell if I know! Posted on Sunday, February 19th, 2017 at 9:39 pm. Subscribe to the comments feed. Both comments and pings are currently closed. Post on your own blog.